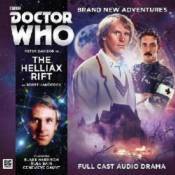 Starring Peter Davison as the fifth Doctor. Daniel Hopkins thought he knew what he was letting himself in for when he joined the top-secret UNIT organization as its latest Medical Officer. Racing about the countryside, chasing strange lights in the sky? Check. Defending the realm against extraterrestrial incursion? Check. Frequent ear-bashings from UNIT's UK CO, the famously no-nonsense Lt-Col Lewis Price? Check. Close encounters of the First, Second, and even Third kind? Check, check, check. But he had no idea what alien beings were really like. Until the day of the Fallen Kestrel. Until the day he met the Doctor.